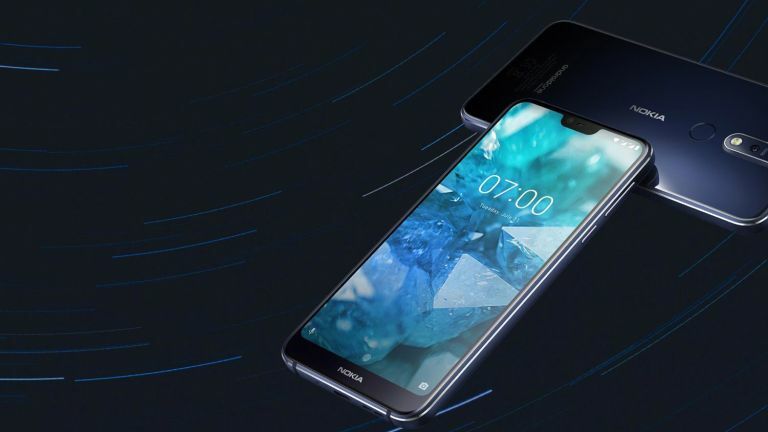 The latest Android-powered smartphone, the Nokia 7.1, has just been unveiled by Nokia's current daddy HMD Global at a press conference in central London, Britain. The newest addition to the Nokia line-up sports a notched display, marking another step towards omnipresence for a feature that started out as the target of a certain amount of controversy and derision, when it appeared on the iPhone X. The notch – a cut-out at the top of the screen that houses camera, speaker and sensors – has now appeared in a number of flagship handsets on the market such as OnePlus 6 and Huawei P20 Pro. The notch has allowed Nokia to squeeze a 5.8-inch Full HD+ display into the physical footprint of a smaller handset. However, there is still a pretty hefty bezel along the bottom of the handset – more than big enough to fit the Nokia brand name. Then again, we've seen a similar compromise from a number of rival manufacturers, notably Motorola and OnePlus. Similar to the TrueTone feature found on iPhones, the Nokia 7.1 automatically shifts the colours on the display so that the picture fits with the surrounding ambiance. The display also supports HDR10, the most popular way of presenting high dynamic range video, and packs a claimed 1,000,000:1 dynamic contrast ratio. The improved display should be visible regardless of whether you're watching HDR content, as Nokia claims the handset can boost Standard Dynamic Range (SDR) images to HDR in a process that churns through 500-million pixels each second. The new Nokia will be available in two finishes – Gloss Midnight Blue and Gloss Steel, both of which feature 'dual-anodised diamond-cut coloured edges', which we think is marketing speak for 'shiny and metallic-looking'. It's not an unattractive phone by any means, but it's also not going to have the Red Dot Design Awards people exactly beating down its door. Powering the Nokia 7.1 is a Qualcomm Snapdragon 636 processor clocked at 1.6GHz, coupled with 3GB of RAM. Nokia will be selling 32GB and 64GB storage models, and both can be expanded via microSD. Nokia 7.1 has a 3,060mAh battery with support for fast charging via USB-C. HMD Global, which now owns the right to the Nokia brand, claims you'll be able to charge 50% in around half an hour. However, despite the Nokia 7.1 sporting a glass back, which often is used to facilitate wireless charging, there's no wireless charging to be found here. Nokia 7.1 is part of the Android One scheme, which means it runs an unmodified version of Google's popular mobile operating system with no preinstalled bloatware. Android One also guarantees better security thanks to the frequent updates and patches beamed directly from Google. Out of the box, the Nokia 7.1 will be running Android 8.1 Oreo – however, Nokia promises that a bump-up to Android 9.0 is coming very soon. Elsewhere, the handset has a dual-camera system on the back that combines a 12-megapixel and a 5-megapixel sensor. These work together to add artificial bokeh blur behind the subjects of portrait-style photographs. Nokia says the dual-lens camera system should produce better, more accurate low light shots thanks to the improved HDR capabilities. On the back, you'll find a dual-camera system that pairs a 12-megapixel and a 5-megapixel sensor. These work together to add an artificial bokeh blur behind the subjects of portrait-style photographs. Since this is an Android One smartphone, you'll be able to use Google's AI-powered Lens system which lets you snap a quick photo of your Wi-Fi password to automatically connect to a home router without typing the secure phrase. Lens can also bring up the Ticketmaster booking page when you snap a poster for an upcoming gig in your town. It can even add reminder to your calendar. Connectivity options are pretty standard and include support for Wi-Fi standards up to AC, but there is also FM radio, for listening to The Eagles whilst cruising down Highway 51, baby. Alongside the Nokia 7.1, HMD Global also took the wraps off a new pair of wireless earbuds, dubbed TrueWireless Earbuds. These AirPods-esque Bluetooth earbuds weigh just 5g each and give you a not epic 3.5 hours of listening per charge. However as usual with such buds, the pocketable charging case is also a battery pack, topping up the earbuds when you don't need them, for around 16 hours more listening time in total. The earbuds are both sweat and splash-proof, meaning they can be worn while jogging in the elements outside. • Pre-orders for the Nokia 7.1 start tomorrow, October 5, in the UK and Europe. The first orders will start to land with customers on October 18, 2018. Prices start from £299 in the UK, while European customers will have to spend in the region of €299 to €349 depending on their region.